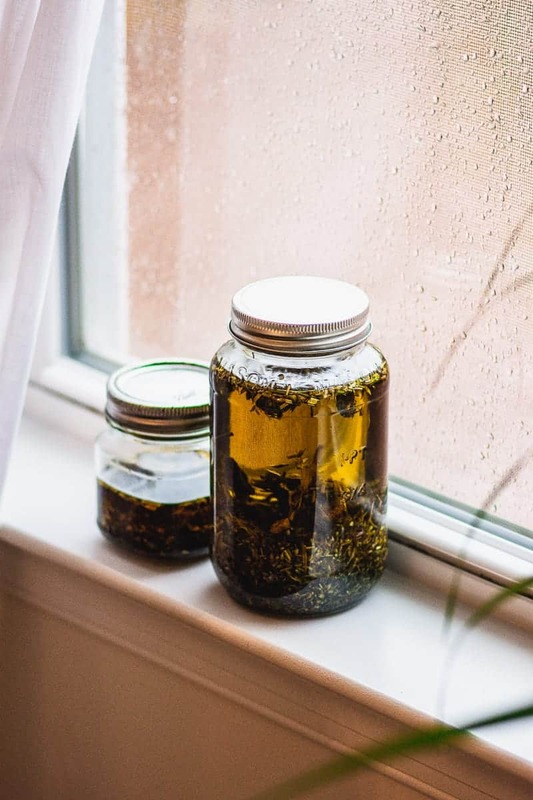 Making herb infused oils is an easy way to enhance your health and cooking. I love making my own skin care creams, salves, and serums using herb infused oil. It’s also a wonderful way to get the amazing medicinal benefits of herbs in your recipes. 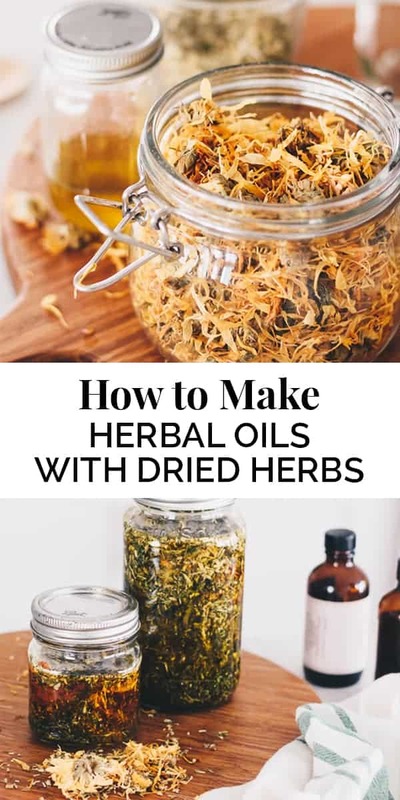 This tutorial will teach you everything you need to know for how to make herbal oils with dried herbs. Here is a complete list with everything you need, all linked to where I buy my supplies. 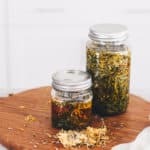 What oil is best for making herb infused oils? Traditionally, most people opt for a good quality olive oil. It has natural antioxidants and anti-viral properties, making it great for a topical salve or balm. However, I specifically use rosehip seed oil and vitamin E oil for my facial serum. Because I have been experimenting with natural facial moisturizers for years, and this is the combination that I keep coming back to. Benefits of vitamin E oil that I’ve felt and seen on my face include reversing the scarring from hormonal acne, and keeping my skin clear. 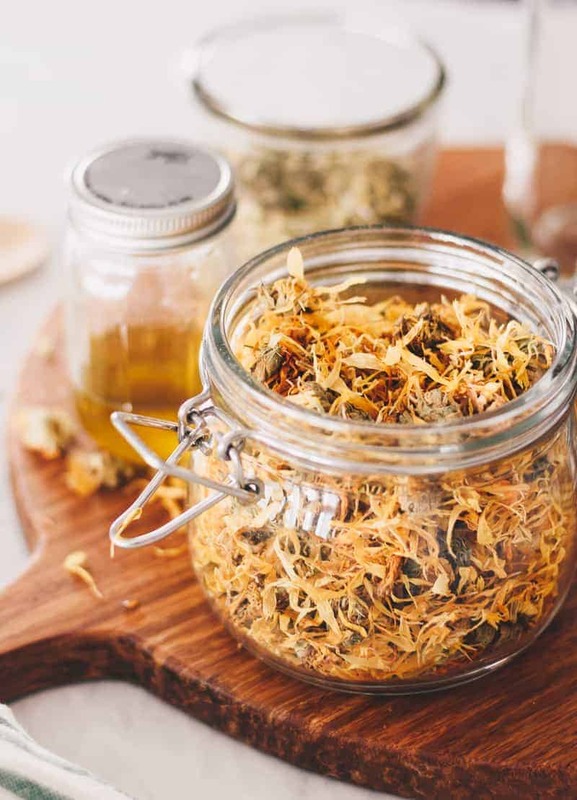 Rosehip oil is commonly used because it has anti-aging properties, protection from age spots, helps with acne scarring, and may reduce inflammation. The process is incredibly simple, and therapeutic, in my opinion! There is something romantic and fulfilling in creating my own herbal products. Quality of herbs. I always buy mine from Mountain Rose Herbs because they are responsibly sourced, processed, and cultivated. And the quality is impeccable. What are you using your herb infused oils for? Skincare? Internal use in recipes? Make sure you get at least 1 oz of each herb, so there is enough to go in the jar. Place the herbs halfway to three-quarters full in a clean mason jar. Cover completely with oil. Make sure they are completely covered. If there are products left to hang out in the air, they can mold and ruin your whole batch of precious herbal oil! Screw on the lid and sit in a windowsill where it can soak in the sun and moon rays. I also like to place an intention on each batch of herbal infused oils that I make. Whether it’s health, wellness, clarity, or love, it’s a great way to connect with the plants. Let them steep in oil for 3-6 weeks, shaking and checking in on it regularly to make sure it’s not rancid. Once the oil is ready, get your sieve, nut bag and funnels! Strain the oils and place the finished product in a clean jar. Store in a cool and dark place. I like to keep mine in the cupboard or pantry. How long should I let my herbal oil infuse? The minimum time I recommend is two weeks. However, I like to let my oils infuse for 4-6 weeks. That way they have time to fully extract the healing properties that each herb offers! As I mentioned above, sometimes a batch goes rancid. I know, it’s sad. But you absolutely want to throw it away and start over if this happens. You can tell it’s bad by the smell and noticing any mold growth on the oil and herbs. To prevent this from happening, make sure all herbs are fully covered in oil, all the way to the top of the jar. Using an herbal cooking oil on drizzled on something like my incredibly popular goat cheese and basil dip recipe would be absolutely DIVINE! Most tutorials I’ve seen use cheesecloth. It’s fine, however I like to buy reusable kitchen products as much as possible to reduce waste. As an herbalist and holistic nutritionist, reducing waste where I can is important to me! That’s why I use a reusable nut milk bag to strain my herb infused oils. Simply place it on top of a small mesh sieve, which is then placed over a glass bowl. Pour in the oils and squeeezzeee! The double layers will keep the finished product oil clean. From there, I use my small stainless steel funnel to pour back into a clean mason jar. Making herbal oil infusions is fun! 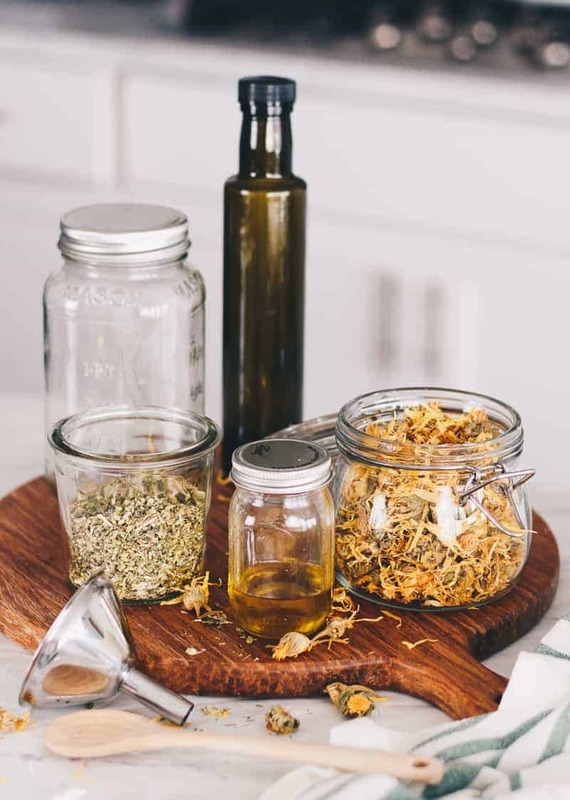 As you can see, making your own herbal oil infusions is a simple and fulfilling way to take ownership of your wellness. Stay tuned for my next post about how to use the herbal oils to make a skin salve and facial serum! And as always, hit the comment box and please ask any and all questions you may have about making your own herb infused oils, or anything related to herbs! Click here to grab your FREE Daily Wellness Toolkit, with simple tips to improve your health so you feel amazing! 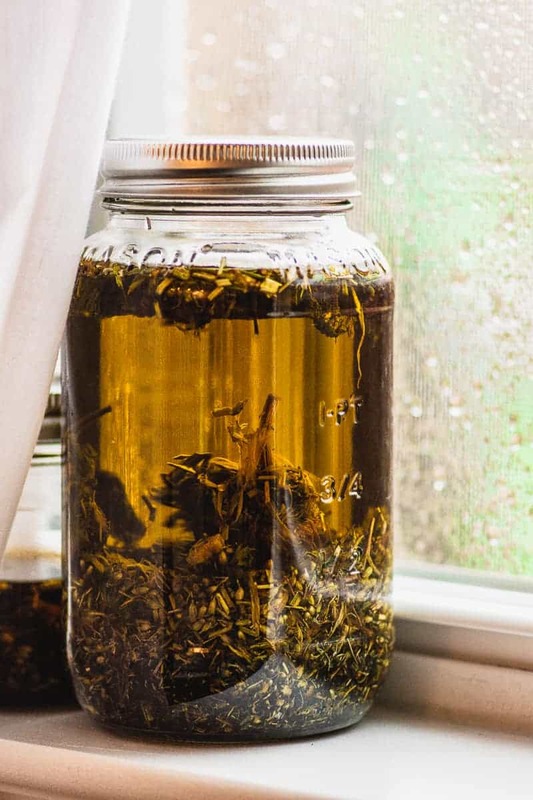 How to make herb infused oils with dried herbs. This tutorial is great for body and skin care products and herbal infused cooking oils. Add herbs to a clean mason jar. Pour oil over the top of the dried herbs, covering completely. Repeat this with as many variations and oils that you want. Once oils are ready, strain into glass jars. To do this, get a glass bowl, nut milk bag, and a sieve. Place the nut milk bag in the sieve on top of the bowl. Pour the herb oils contents of the jar entirely in the bag. Squeeze until all oil is out, and has strained cleanly through the sieve. Placing the funnel atop a clean mason jar mouth, transfer the prepared herb infused oil. Store in a cool dry, place. Use as needed. Herb infused oils keep up to one year if stored properly in a cool, dark place. Love this tutorial! When you say “cover the herbs,” do you just cover them and leave the rest of the jar open, or do you fill the jar? The photos suggest the latter. Also, when making infused oils for cooking, do you do anything to the herbs first (like roast/peel the garlic)? Do you have to strain them, or can you keep the cooking herbs in the bottle? I’ve seen that in stores but suspect that would increase the chance of it going bad. Excellent questions! I fill the jar completely, ensuring the herbs are entirely covered. As for infused cooking oils… if they are fresh herbs, it is best to peel and roughly chop to release the juices and healing parts of the herbs. I personally like to strain mine, because I don’t like the risk of the oil going rancid. 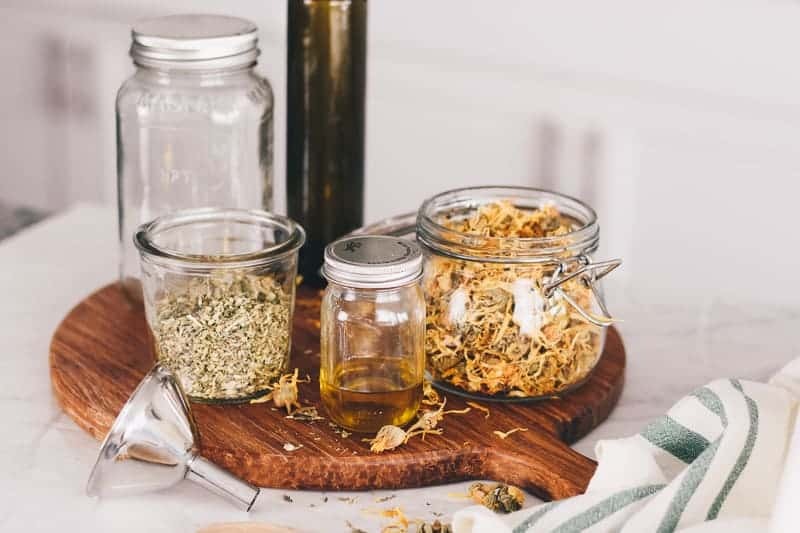 If the herbal cooking oil is used within a relatively short time period (1-2 months), I would say they are safe to keep in the oil without straining.